SINGAPORE - Vesak Day may be celebrated by Buddhists around the world, but for some young people of different faiths and races, it was a chance to do good and spread the message using Instagram. In the two weeks leading up to May 29, a group of volunteers documented on social media more than 120 good deeds they had done, from teaching the elderly how to use smartphones and giving people directions to picking litter and picking abandoned bikes off the pavement. 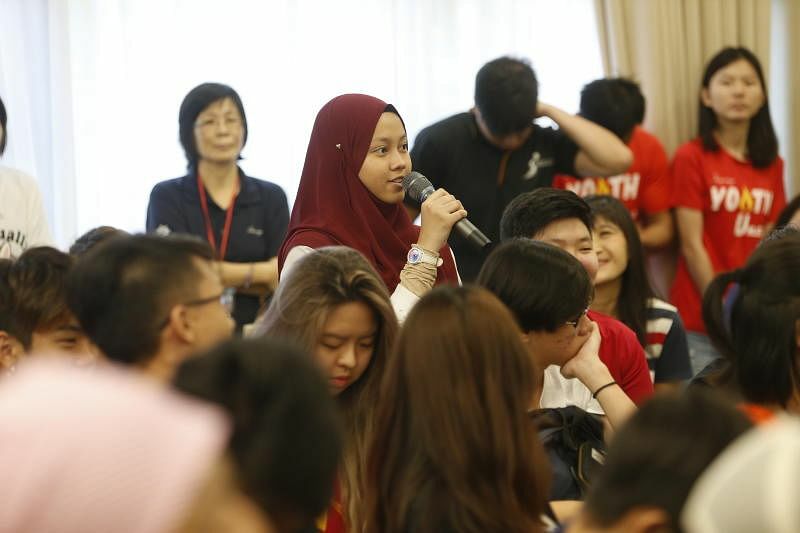 The 70 volunteers included Racial Harmony Youth Ambassadors from South East Community Development Council (CDC) and youth volunteers from Buddhist organisation Shinnyo-en Singapore. One of them, permanent resident Giron Althea Isis Canonizado, 17, who is a Christian, said the social media campaign was an effort to reach out to more people. "We also wanted to do something in line with the core values of Buddhism, like being mindful of others and our environment," she said. Buddhists mark the birth, enlightenment and death of Buddha on Vesak Day. On Tuesday the volunteers also visited Shinnyo-en Temple in Eunos to learn more about the religion through a tour and a question-and-answer session. They also spent the morning at Masjid Khalid in Joo Chiat helping to cook and pack porridge for members of the public, which the mosque does as part of the Ramadan tradition. The activities are part of South East CDC's "Celebrating our Festivals" series, an avenue for Singaporeans from different faiths and races to learn about the major festivals here. National University of Singapore civil engineering student Mirabel Loh, one of the volunteers, said she understood more about Shinnyo-en Singapore and its teachings after the visit. It was also her first time packing porridge at a mosque and seeing how it is done. "We all got a chance at stirring and packing... It was heartwarming to come together and we're all trying to do something for our community," said the 22-year-old. Around the island, devotees marked Vesak Day in different ways. Thekchen Choling, Singapore's only 24-hour Tibetan Buddhist temple, unveiled a four-storey-high handcrafted depiction of Buddha. The temple in Jalan Besar also held a fair with nearly 20 food and lifestyle stalls, and distributed gift packs comprising daily necessities to more than 1,000 households around the temple. It also gave 47 bursaries worth more than $13,000 to students from low-income families at a ceremony. Sales engineer Loh Ming Yang, 30, said: "Besides it being a religious occasion, it's very heartwarming to see friends and family coming down for the festival." Mr Loh who took a deeper interest in Buddhism 10 years ago said: "Vesak Day is a day of inspiration and a constant reminder of Budda's teachings. "The festival reminds me of all the teachings which inspire me to become a better person, to continue to practise (Buddhism) and continue to bring benefits to my family and friends around me." 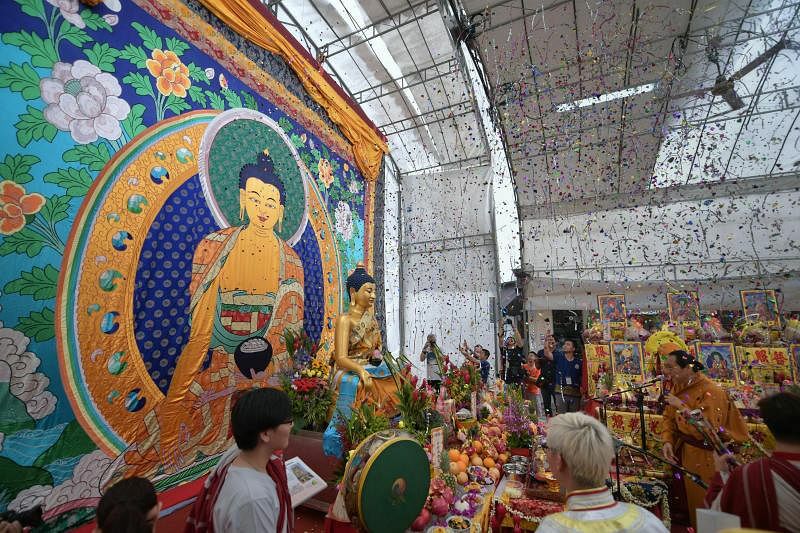 At Kong Meng San Phor Kark See Monastery along Bright Hill Road, prayers were held in the morning, while devotees and visitors watched stage performances and took part in activities such as flower mandala-making, sutra writing and colouring. The celebrations also included a Vesak Fair selling thrift items and vegetarian snacks, a photo exhibition of the monastery's history, and a sale of pre-loved items donated by devotees.